What upp Caribou Nation!?!!! We can’t believe it’s already spring time!! Now that camp is only 87 days away, its time to truly gear up for the summer. Things have been rockin’ here in the Caribou headquarters. Bill just got back from a ridiculous week up at camp. Bill, Frank, and Frank were running wild and cranking things out, working on the three new tennis courts and the new wood shop. The wood shop/arts&crafts is getting a total face lift. We’re taking the boat house, building a whole new roof, adding a 26×20 addition, and building a porch over looking Pattees Pond. IT’S GOING TO BE SICK!! This weekend, Bill and Martha are off to Florida for Jesse Clark’s Bar Mitzvah. Good luck Jesse, rip it up!! This summer, the Clarks’ will becoming an even bigger presence, as Justin and Joshua, Jesse’s brothers, will be joining the Caribou family!! Also this weekend… Lori and Rotman will be heading up to Manchester, NH for the ACA New England Conference. Alumni Update: Lee Coppersmith of Johns Hopkins University and Caribou Alum, made the cover of Lacrosse Magazines April issue. 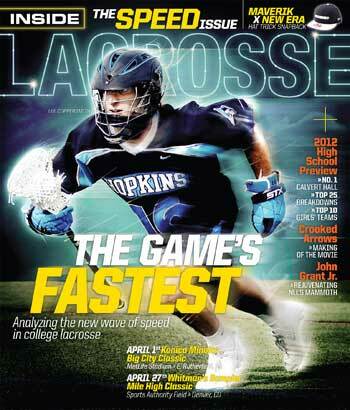 Coppersmith has been tearing it up for Johns Hopkins. Recently they took down No 1. Virginia in an overtime thriller. DO WORK Lee! Caribou Spring Fling – On April 15th, if you’re in the Greenwich, CT area, we will be getting together for a little spring get together. We’ll be playing basketball, football, swimming, and having some pizza!! The entire Lerman family and Rotman will be there, let us know if you can make, and we will send you more information. Staff Update: KUBA IS BACK!! I don’t think we need to say anything else. Keep in touch and see you guys soon! !